I loaded up the kayak and all of my fishing and camping gear and began the long journey from Dallas to Corpus Christi, TX. I arrived after dark and drove along the beach to my campsite. Straight off shore on the horizon I could see the blinking lights of my destination: the Mayan Princess oil rigs. I pitched my tent near the water and climbed in, thinking of nothing but the adventure that lied ahead. When I awoke the conditions were ideal: the surf was flat, the wind was calm, and the water looked like glass beyond the breakers. I was amazed at the beauty of this place; it was not at all what I think of when I hear “Texas coast”. The sand was white, the water green and clear, and hardly any seaweed in sight. At around 7:00 AM the guys I was meeting began to arrive so we loaded up our kayaks and set off into the surf. The three mile journey to the oil rigs could only be described as pleasant and serene. I saw a piece of trash floating in the water so I pedaled over to grab it and throw it in my kayak. My hand stopped inches above the bag when I realized it was not a bag but a huge Man o’ War. I looked up and realized they were everywhere. Needless to say, I elected not to go for a swim that day. I was trolling on the journey out, and as I approached the first rig, BOOM one of my reels starts screaming as the line peels off the reel. I grabbed the rod, tightened the drag, and held on for the ride. The water clarity this far out was simply incredible. A half hour into the fight, I looked down and could see a beautiful shade of yellow and gray over 20 feet below me. I had hooked into a gorgeous Jack Crevalle. This thing put up an incredible fight. I pulled it up into the boat and was grinning from ear to ear. 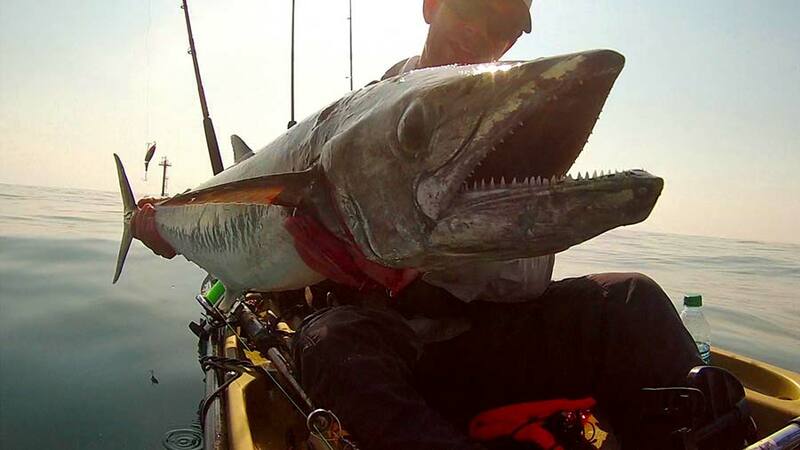 I had landed my first deep-sea fish from the kayak, and it felt amazing.